Posted by Atul Chitnis on 15-June-2012 . OK, so this is an unusual post for me, but it had to be done! Getting a satisfactory “mouthfeel” while drinking from a bottle is not difficult, but a surprising number of people just don’t know how to do it right. The worse possible experience is probably sucking the drink through a narrow straw. You get very little liquid in the mouth with all that effort. Unsurprisingly, many people prefer drinking from a glass, because they get a large quantity of liquid in the mouth with almost no effort (gravity does the job). Now if you look at why you get such a good mouthfeel when drinking from a glass, you will understand that you can also get it while drinking from a bottle – you just need to use a little trick. Look at typical “bottle drinkers” – they lift the bottle to their mouths, grasp the entire top rim of the bottle with their lips, tilt back, and let the liquid flow into their mouths. Except that it doesn’t – at least not in a satisfactory way. 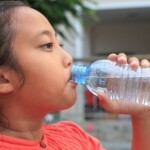 You see, how much liquid gets from the bottle into your mouth depends on how much you “give back” to replace the liquid – in this case, this would be air. As soon as a balance is achieved, the liquid stops flowing, usually short of a satisfactory measure. So here’s the trick, which is as old as the hills, yet surprisingly uncommon in use: don’t grasp the rim of the bottle with your lips. Instead, rest the rim on your lower lip, and gently push the upper portion of the bottle rim against your upper lip, not under it. Look at the picture above – the little girl gets it right. Now open your mouth slightly, and tilt your head back. The liquid rushes out of the bottle, and flows into your mouth. But this time, because air can continue to enter from the side of your mouth and the bottle rim, the flow is continuous, resulting in a fantastic, satisfactory mouthfeel. And with practice, you can literally gulp down an entire bottle’s contents without once stopping to release air locks (or apparently “coming up for air”). Simple as this may sound, it can be quite impressive (and satisfying). Give it a try if you haven’t yet, and whack your “bottle sucker” friends across the head next time you see them puckering up, desperately trying to get more beer into their mouths! As an added point of interest about “mouthfeel”: here where I live (in India), a well known fruit drink saved itself from extinction when they replaced the tetrapack and small straw combo with a tear-off tab opening on the tetrapack. The resulting greater flow volume increased the mouthfeel to a point that the customer was a lot more satisfied (and refreshed, though that may be psychological), and the fruit drink clawed its way back from the brink to again reign in the market. Previous post: Tablets Are Not Mobile Devices!